Text Messages, Radio Warn Haitians Of Cholera Risks The cholera epidemic in Haiti is slowly spreading into new areas, mostly in the north of the country. Public health officials are racing to get health tips and warnings to the public via radio broadcasts and text messages to cell phones. 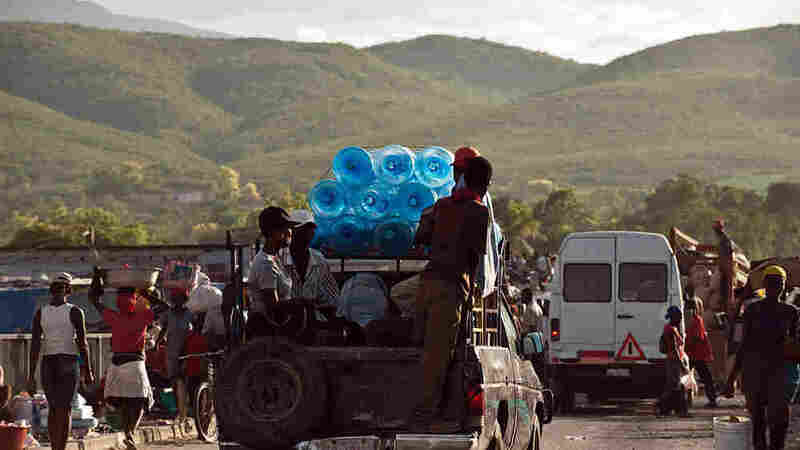 Empty water containers are transported by a truck at a market north of Port-au-Prince on Oct. 27, 2010. 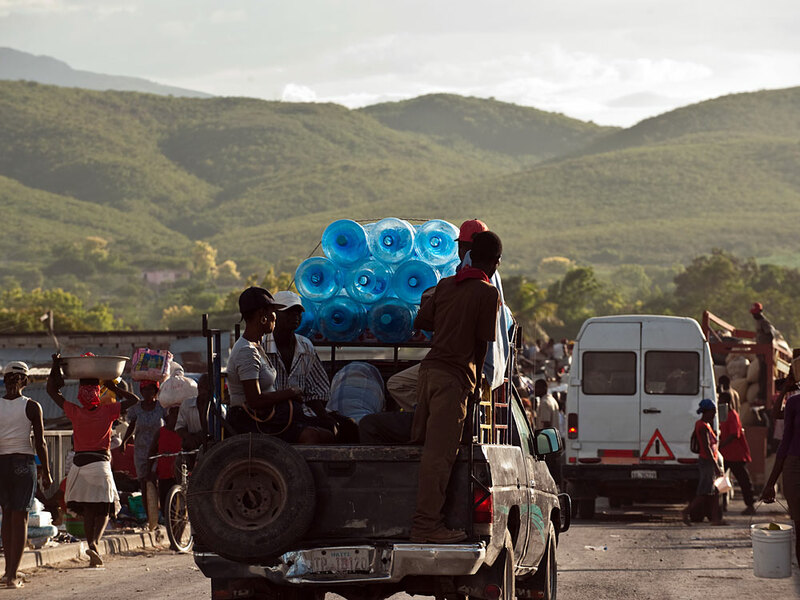 The cholera epidemic in Haiti is slowly spreading into new areas, mostly in the north of the country. The good news is that it doesn't seem to have taken hold in Port-au-Prince, the country’s densely populated capital. As they track the disease's progress around the country, public health officials have launched a two-pronged education campaign using radio broadcasts and text messages to keep the epidemic out of the camps. The Cahamega camp sprawls along a city street while trucks and cars rocket by on one side and planes land and take off on the other. The camp itself is a maze of tents, each separated by only a few feet. It's as if you're walking through a field of giant mushrooms -- a dirt lane serves as "main street," and people who live there set up tables to sell food, whiskey and socks. A woman sits in a chair getting her hair done. Farther along, a truck is pumping water into a huge bladder that serves as the camp's water supply. It's 20 feet square and 6 feet high. Several radio producers who work for the International Organization for Migration, a group affiliated with the United Nations, are visiting the camp. They file into a tiny, makeshift theater with tarps thrown over scaffolding, and a dozen benches of rough planks. A pack of curious kids crowds the benches and all eyes are on Jethro Sereme, a tall, good-looking student at a local university who stands in the front. The crowd is eager for something different from the humdrum of camp life. Sereme grabs a microphone and starts talking about cholera. He works the crowd and is clearly enjoying the moment. The migration organization works with the government's Ministry of Health to educate people about cholera. The appearance is being recorded and will be broadcast on 40 community radio stations. 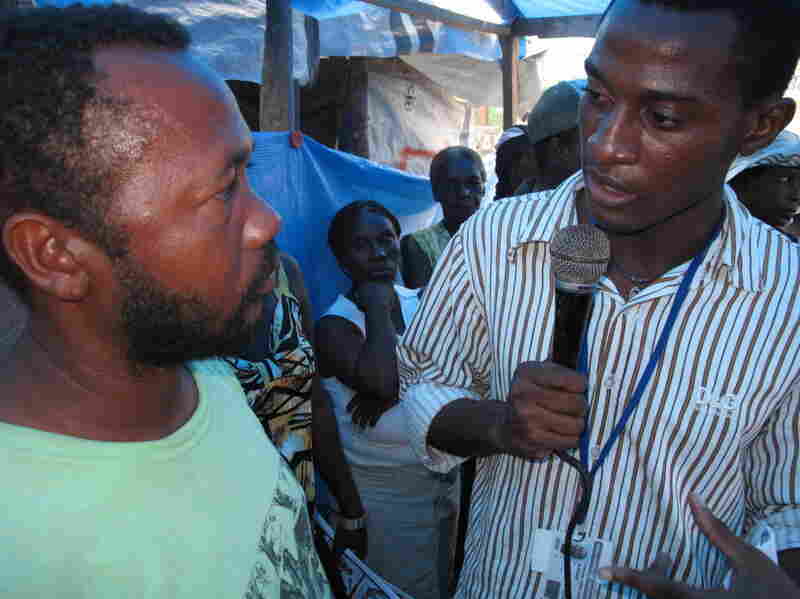 Since people in Haiti get most of their news from radio, it's one arm of the frantic campaign to keep the cholera epidemic that started to the north from coming here to these overcrowded camps. Another effective communication method is the cell phone. Working with the country’s biggest cell phone carrier, the migration organization is tracking cell phone owners who live in the northern epidemic areas -- people who may carry the disease without knowing it. Leonard Doyle, the organization's communications director, is at the U.N.'s logistics center and pulls up an image on his computer screen. "Here we see a map of Haiti showing, in particular, movements of people as tracked by their cell phones," Doyle says. "When people move around in any country in the world, their cell phones are triangulated between cell phone towers. That means the cell company can track them." Tracking them gives health authorities an idea where the epidemic might spread, and where to send medical teams. "You can not only tell how many people have left, but where they've gone to and when. And then the next step is contacting them," Doyle says. "So if this was a typhoid outbreak, these are the Typhoid Marys. And we’re trying to reach out to them in a digital fashion." These people get a text message to call a number, where they'll hear about cholera prevention. They'll also get text messages about how to deal with the disease, should they become infected. Those messages are the jurisdiction of Sabina Carlson, one of the organization's community liaisons. She reads one of the recent text messages: " 'Continue to breast feed young children even if they have diarrhea.' It's a message the Ministry of Public Health thought was very important to go out." Cholera is new here, and many are fearful. A tent clinic for cholera that was under construction in Saint-Marc, to the north, was met with angry demonstrators who didn't want it in their community. It was dismantled. Officials with the IOM say that's why education -- via radio and cell phone -- is so desperately needed. Cholera doesn't need to be a killer, they say, if people just know more about it.